How to draft a Director Curriculum Vitae sample that will impress? How to grab your futures employers’ attention when you are applying for a new job as a Director? Download this Director Curriculum Vitae sample now! This Director Curriculum Vitae sample template will grab your future employer its attention. After downloading and filling in the blanks, you can customize every detail and appearance of your resume and finish. Completing your Director Curriculum Vitae sample has never been easier, and will be finished within in minutes... Download it now! 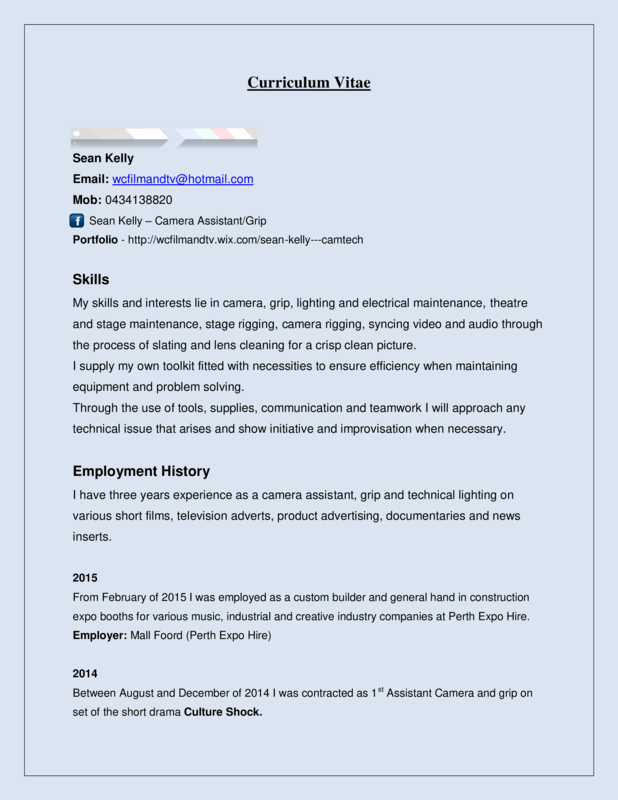 Curriculum Vitae Sean Kelly Skills My skills and interests lie in camera, grip, lighting and electrical maintenance, theatre and stage maintenance, stage rigging, camera rigging, syncing video and audio through the process of slating and lens cleaning for a crisp clean picture.. Employer: Liam Kelly Qualifications Diploma of Screen and Media Film and Television Central Institute of Technology, Northbridge, Perth Semester 1 2 2013 As part of this qualification I have gained experience on set as a Director of Photography, Camera Assistant and Key Grip while being assigned a mentor from the Film Industry working as a Camera Assistant..